There is just something about the architecture of Liberty Square that inspires me. The detailing used on the buildings down to the shutter hinges is impressive. The best example being on the southern facing window at the Columbia Harbor House. I bet you've never noticed but the shutters are crooked, that's because the hinges would often be made from leather and leather would deform over time. But I digress since I can't find my picture of it. 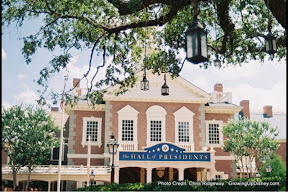 The Hall of Presidents has to be one of my favorite buildings in WDW. Love it! We really enjoy the Hall of Presidents! Hall of Presidents is also the best place to take a need-to-nap baby in the heat of the day! Great blog and your logo is beyond amazing! On behalf of Chris (aka Ridge) thank you all for the complements on his post. WDWDisneyDiva, thank you very much! 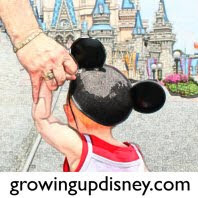 The logo was created by a good friend from a photo I took of my oldest daughter's first walk down Main Street USA. She's holding my dad's (aka DisneyDad) hand.